Cape Town - The technology start-up space is a major drawcard for many of the world’s brightest and most ambitious young minds. Lured by the prospect of developing the next Facebook, Google or Instagram, these techno-whizzkids constantly create and launch new apps, platforms and other tech-based product offerings, in the hope that one of them will fly, be sold for a billion dollars and they can retire to their island paradise and sip margaritas all day. In truth, the harsh reality is that the odds of such runaway success in the tech space are probably about the same as a budding actress from Benoni making it as an A-list star in Hollywood. Oh wait … Charlize aside, for every moderately successful tech-based start-up, there are literally thousands of ideas, apps, products and services – many of which burnt through millions of dollars in investor funding – that never made any money. The reasons for this litany of failed products and dashed dreams are numerous, and more often than not linked to the cash runway ending before the plane can take off. Simply put, it costs big money to get a tech-based offering off the ground, and this is compounded by the fact that many tech products do not generate any income until they are far down the road, and can take years to achieve profitability or economies of scale. By way of example, Hubspot generated $186.4m in revenue last year, and still lost money. One entrepreneur who has experienced first-hand the rollercoaster ride that is the tech start-up space, is Cape Town-based Sheraan Amod. 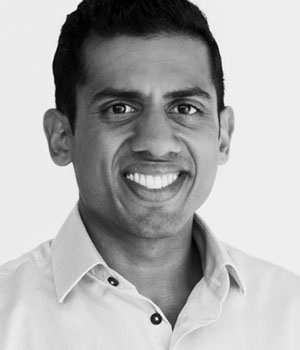 A veritable veteran of the tech industry at the relatively young age of 30, Amod has spearheaded the development of three major tech-based start-ups over the past decade or so, both in the US and here in South Africa. 1. You have been operating in the tech start-up space since 2008. What made you choose this industry specifically, or did it choose you? 2. You have founded three businesses over the past 7 years (Personera, Springlab and RecoMed). Which of these has been the most valuable in terms of lessons learned, and why is that? Founding start-ups is a lot like falling in love. They begin with passion and energy, but sure enough great heartache is also part of the journey. Everybody knows that their first great love and subsequent heartbreak change them the most... so if I am to relate this to my career I’d have to say that Personera was my most valuable experience. I was young and foolish enough to dare to go global with a world-first concept, and while we did eventually commercialise and sell the company in the US, it was only after some incredibly draining and difficult periods that I don’t wish to repeat. While other companies I’ve started have had their own special challenges to conquer, it was pretty smooth sailing in comparison to Personera. The simple lessons I took away from Personera were three-fold, viz. (1) innovation is useless unless it delivers value (and customers will thus pay for it), (2) never give up, and (3) never ever give up! 3. You describe yourself as a Renaissance Man. Does your love for learning and culture influence your approach to business, and if so, how? I sometimes describe myself as an “aspiring” Renaissance Man, but I don’t take this moniker too seriously. Mostly, I’m just a very curious person, and enjoy all forms of learning and expressing myself in different ways — be that in running a start-up, writing essays, or participating in boxing matches. I believe that having a broad field of vision, while being able to develop laser focus on key aspects and connect them together, does create an advantage in business. It’s well known that the greatest innovations usually occur at the intersection of different disciplines and cultures. 4. What are the three most important things an aspiring tech entrepreneur should know? - Cash flow is more important than your mother. I borrowed this one from the legendary Ken Morse of the MIT Enterprise Forum, but it’s too good not to share. Cash is the oxygen that keeps start-ups alive. Founders need to understand how much they need and what rate to use it, but at the end of the day even the most promising companies can be destroyed quickly by a cash flow crisis. - Luck favours the persistent. Start-ups almost never “succeed” early and grow sustainably — regardless of what investors may wish for. Most encounter several torrid periods that threaten the company’s existence. Push through these periods and just keep surviving. Eventually things will grow again, or a game-changing opportunity will arise that the company can capitalise on. A lot of observers like to call this phenomenon “luck”! So in summary I would say be bold, watch your cash flow, and don’t give up! 5. Collectively, your business ventures have managed to raise impressive amounts from investors, including venture capital, angel investment, equity finance and other financial instruments. Is there any preferred source of finance for a tech start-up, and what do potential financial partners look for above all else? There is no preferred source of funding, because the sources change depending on the stage that the company is at. I favour friends, family and angel investors at the seed stages, then venture capital once the company is clearly on a growth trajectory. In all of my experience, I notice financial partners asking the same three questions, in this order: (1) Is the founding team bankable? (2) Is the business opportunity big enough? and (3) Is the risk worth it? A “bankable" founding team usually carries a combination of smarts, domain expertise, experience, reputation and commitment to the start-up. A "big enough" business opportunity usually means a company that can generate at minimum R100m in annual revenue at high net margins. “Risk” is a tricky one, but most commonly refers to the price of the deal, i.e. does the investor feel that they are receiving sufficient equity in the business to produce a valuable return? 6. You were quite well established in the US, but made a decision to move your operations back to SA. What prompted that return home? I returned because I could see large economic opportunities that nobody was going after properly. South Africa combines many elements of developed and emerging markets, and can be a great place to build a sustainable business base from which to expand to other similar emerging markets. There’s a lot of negative stuff going on in the media these days, but long-term I believe things will get better and well-prepared entrepreneurs will succeed. 7. Finally, tell us a bit about RecoMed, and why it seems to be making some waves in the healthcare space? Every month, more than one million doctor-related Google searches are made in South Africa alone. I can’t even guess how many phone calls are made by patients and call centres to organise healthcare bookings nationally — probably hundreds of millions. I saw an opportunity to make this process simpler, quicker and more seamless, and to close the loop between searching, calling and booking, by developing a platform that allows people to do both. In essence, RecoMed is an online platform listing healthcare practitioners that also offers a real-time booking facility for patients wishing to make an appointment — which they can do in seconds using their phone or tablet. It also integrates with any existing practice management software that doctors may be using, as well as with call centres that manage bookings on behalf of patients. RecoMed’s platform is also being applied to large scale healthcare solutions, such as use in wellness screening days, chronic disease management programmes, and coordinating insurance medicals. It is still quite early days, but the response has been overwhelmingly positive and we have the support of many of the really big players in the healthcare space, so I am thoroughly enjoying the ride in what is a new industry for me. * Amod is passionate about sharing the lessons he has learned via his blog (http://sheraan.com/ ). He can be contacted at sheraan@recomed.co.za or visit www.recomed.co.za to learn more about his latest tech-based venture. * Anton Ressel, a regular Fin24 small business columnist and expert answering user questions, is a mentor and business development specialist.